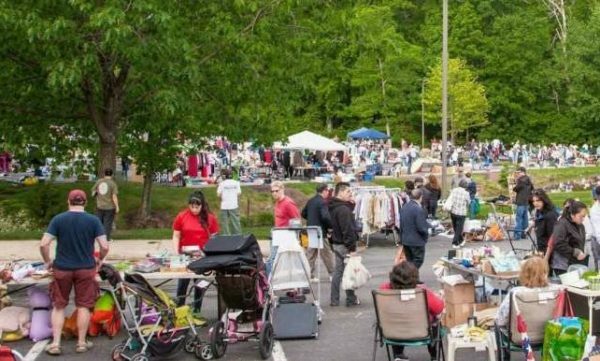 The window for spring cleaning may be over, so there’s no harm in taking advantage of some deals (and possibly steals) from your neighbors at tomorrow’s Reston Community Yard Sale from 8:30 a.m. to noon. Around 85 families are signed up to sell a mix of items at the event, which is located in the parking lot behind 1900 Campus Commons Drive and organized by Reston Association. But before you head out, make sure to check RA’s website and social media for updates in the event of cancellation due to rain. A tentative rain date has been set for Sunday. Between noon and 5 p.m. this weekend, you can drop in at the Reston Art Gallery & Studios (11500 Washington Plaza West) to take a look at art created by local first responders. The art show is called Ashes2Art. End tonight with a special benefit concert by Reston’s Diva Duo at the United Christian Parish (11508 North Shore Drive) from 7:30-8:30 p.m. The cost of admission is $25. All proceeds will help support Reston and Herndon residents who are facing crisis and at risk of losing their homes, electricity or water. Don’t head to any Fairfax County libraries today, as all branches will be closed for staff training. On Saturday from 8:30-10:30 a.m., the Susco 8K and 2K is back for its 11th year at South Lakes High School. The event aims to raise money for brain aneurysm research and organ donation awareness programs. A former Arlington prosecutor and Fairfax County native will sign copies of his first novel, Daingerfield Island, at Scrawl Books (11911 Freedom Drive) from noon to 2 p.m. on Saturday. Reston Regional Library reopens on Saturday. Children between the age of 6 and 11 can invent a “drawbot,” a machine built to move and draw. Participants can also take their drawbots home. The event will take place from 2-3 p.m.
As the Building Worlds exhibit comes to a close, the artists behind the exhibit at Greater Reston Arts Center will provide some insights on the inspiration and meaning behind their work. The event on Saturday will take place from 5-7 p.m. Earlier on Saturday, one of the artists, Rachel Guardiola, will lead a sensory workshop to create artwork inspired by her work. The event, which will run from 1-3 p.m., is open to all participants 18 and up. Robert Prather, author of “The Strange Case of Jonathan Swift and the Real Long John Silver,” will give a talk on the story of local pirate Jonathan Swift on Sunday from 2-3 p.m. at Reston Regional Library (11925 Bowman Towne Drive). Kids interested in dueling it out can participate in a Chess Club for Kids, also at the library on Sunday from 2-4 p.m. If birdwatching is your cup of tea, you can do so at Stratton Woods Park from 7:30-10:30 a.m. on Sunday. During the walk, which is cosponsored by Audubon Society of Northern Virginia and The Bird Feeder store, attendees will visit a variety of sites. And if you’d rather stay indoors, there will be an open house at The Lake House (11450 Baron Cameron Avenue) from 4-6 p.m.